It actually looks as though the public doesn’t care about the deficit either, at least relative to the state of the general economy. So why is the deficit such a big issue right now, at least in Washington? appoint a deficit reduction commission. And the answer there is some combination of “the deficit actually needs to be addressed” and “the president felt there was a political weakness that needed defending”. Why the president felt a weakness on deficits is another, mysterious issue. I don’t think this is quite right. Leaving aside whether it was a good or bad idea, the deficit commission was a response to deficit hysteria, not the cause of it. And I don’t think it was all that mysterious, either: it was basically a response to an excellent political game played by Republicans. Think about it: if you’re opposed not just to a single initiative from the opposing party, but to every initiative from the opposing party, what’s a handy umbrella for expressing that uniform opposition? Answer: deficit panic. After all, just about everything Democrats propose can be spun as a deficit buster. And it’s pretty easy to to gin up the Republican base with talk of eventual doomsday and devalued currency. 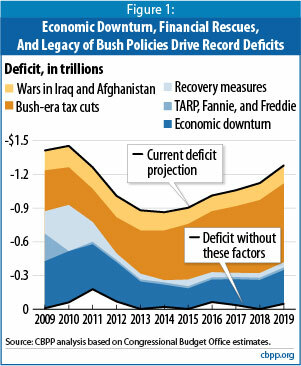 The deficit is just a perfect issue for Republicans and they did a great job of getting the maximum mileage out of it. So you have to give Republicans an attaboy for playing the game well. The question is why Team Obama felt like they had to respond. And here I suspect Ryan is basically right. Obama probably really does believe the long-term deficit needs to be addressed, and he’s pretty famous for listening to his inner technocrat even if it annoys his base and makes for poor politics. And he probably really did believe that the existence of the commission would take some of the air out of the Republican attack. This is more mysterious, since there was never any chance of that happening. There’s no way that a nonbinding commission was ever going to have the slightest effect on what Republicans knew was a very effective line of attack against Democrats. But it’s too late now. As Ryan says, it all might have made some sense if Obama could have spun “medium-term deficit reduction as a means to create the fiscal room for more stimulus.” But he never even tried to do that, and the moment when he could have pulled it off is long gone. Too bad. It would have been good politics and good policy.